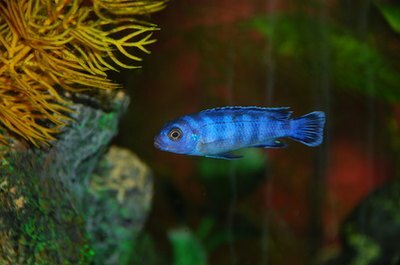 Cichlids are known for their striking colors and bad attitudes. Found worldwide in freshwater environments, cichlids are a diverse family of fishes, but all of them are aggressive. Cichlid tanks are best limited to cichlids only, and only cichlids from the same continent should be housed together. A few species of catfish and plecostomus can get along with cichlids. The cichlid family includes some fish that can mix better than others. Most cichlids bred for aquariums are African lake or South American cichlids. South American cichlids are more diverse in body type and behavior, and more of the South American species can mix with other fish. Mixing African and South American cichlids is a recipe for disaster, because their immunities are different. Cichlids from one region can make cichlids from the other region very sick. Few other fish can get along with cichlids, which generally are toothy, aggressive, and super-territorial. Fish placed in a cichlid tank need to be very fast, be able to hold their own against aggression, and must naturally exploit different regions of the tank than the cichlids. Cichlids are open-water swimmers, and they defend distinct territories. Good tank mates for cichlids are fish that prefer the bottom or sides of the tank, out of the cichlids' way. They also must be a match for cichlids in aggression and size. Peace-loving fish will quickly become a cichlid meal. Even speedy tank mates who don't make an easy dinner can get stressed out by the constant territorial aggression of cichlids. Catfish are one fish type that can co-exist with cichlids. Like cichlids, catfish are extremely diverse. Choose South American catfish for a South American cichlid tank and African catfish for an African cichlid tank to avoid disease problems. Large, speedy, aggressive catfish can do well with cichlids, as can slower species that hide. Inspect the tanks at local specialty fish stores; check out the species they keep with cichlids: Are they healthy and thriving, or do they look beat up and stressed? Some people choose heavily armored tank companions for their cichlids. The South American plecostomus ("sucker fish") is popular for cichlid tanks. It has spines, armor, is a bottom feeder, and is ornery -- it even hates its own kind. If you have a pleco, you'll need to feed a special diet to ensure it gets enough food. It cannot live off tank algae alone, and it does not eat fish waste. If you add snails to a cichlid tank, they will eventually become a tasty treat for large, aggressive cichlids. Are a Cichlid & Koi Compatible in the Same Tank?